1. How can I be sure about the purity of gold? All products be it 22K, 18K ,14K are BIS hallmarked (check for engravings on the product). Only 9K jewelry does not have a hallmark, according to the new government norms. Although, we provide our own stamp of authentication for 9K. 2. How can I be sure of the diamond quality and weight? All of our jewelry is laser inscribed with the diamond weight. Additionally, we also provide a certificate for all our products, which states the weight and quality of the stone. 3. How can I be sure that the details of the product I have purchased are authentic? Most of our products are BIS hallmarked (check for engravings on the product) and we also provide a certificate for all our products, which states the weight and quality of the stone, weight and purity of the metal. Additionally, we offer an assured buy back feature, where you can sell us our jewelry for 15% less of the purchased value at any time. 4. Will the 9K gold turn black in the long run? No, 37.5% is gold rest is alloy. This makes the metal harder and stronger but does not affect the texture and shine of the metal and will never turn black. 5. My favorite piece of jewellery is sold out, but it was in stock just a while back? All our products are unique, we don't make two of the same thing. Therefore, it is highly likely that it may have been sold out. So act fast! But if you missed the opportunity to buy it immediately and your heart is set on that product we can make one for you on order so don't worry. Just get in touch with us. 6. Can I get the jewellery in a different gemstone or metal not offered on the website? Of course, you can. Just contact us on contact@tatiwalas.net or call us on +91-141-2577085 and we will be happy to assist. 7. Can I get my own design manufactured? Most certainly. 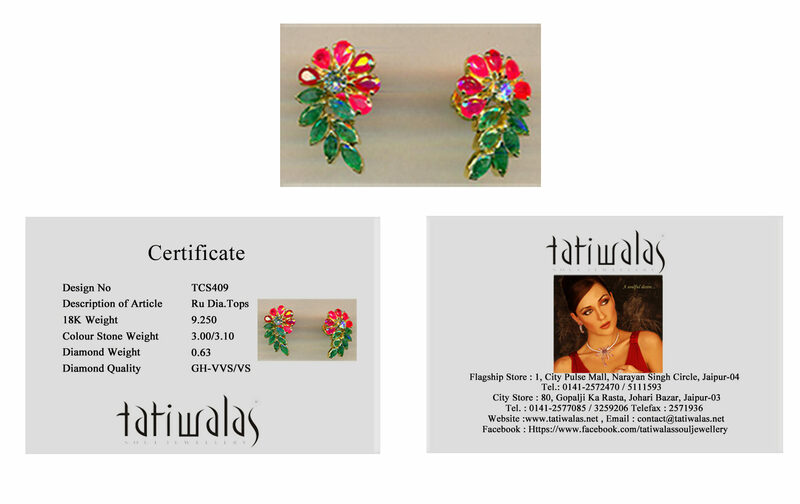 Just contact us on contact@tatiwalas.net or call us on +91-141-2577085 and we will be happy to assist. 8. Can I order a ring/bangle in a size that isn't offered on the site? We can get a new one in the same design made for you in your size. Just get in touch with us. 9. What standard do you use for ring and bangle sizing? We use the Indian standard for ring and bangle size. 1. Is my parcel insured? Yes, all items are insured from Tatiwalas against theft and accidental damage whilst in transit. Once the package is delivered and signed for, they are no longer covered by insurance. 2. What will the packaging be like? We send our product with utmost care; the product will be packed in a plastic box filled with cotton to prevent damage in transit. We also send out our popular and stunning gift box with each product. All our products are insured when they are in transit against theft and accidental damage. 1. Do you offer a 100% refund option? You can return our product to us within 15 days (for domestic purchases) and 30 days (for international purchases) to get a full refund, provided that the product reaches our store within 15/30 days of purchase. After 15/30 days, you can return our product for 85% of its purchased value at any time provided the product is not broken or damaged. We provide an assured buy back policy where you can return our product to us for 85% of its purchased value, provided that the product is not broken or damaged. You can use this amount to buy another product or to get cash or credit of the same amount.